Can a Chair Have Just One Leg? With its pedestal base, the Tulip Chair made history as one of the first one-legged chairs. Saarinen was well aware of the nonexistence of a one-legged chair, so he deliberately took upon himself the challenge of creating one. The Tulip is a pedestal swivel chair with an aluminum base and a molded fiberglass shell. The use of fiberglass was very innovative at the time, and the material provided a lot of flexibility with formal expression. This allowed Saarinen to achieve a fluently organic piece. Its overall form is evocative of a flower that seems to grow out of the ground. To emphasize the unity of the piece, both the base and the shell are finished in a similar way. However, it denies the nature of its materials. In contrast with the flower that inspired the piece, the metal base and fiberglass shell appear as though they are made of the same material. This was a challenge that the architect tried to avoid in hopes of producing a single-piece chair made of fiberglass. However, this design proved to be structurally unsound, and Saarinen did not adjust the design to reflect this change but instead forced his original vision onto the new materials. Can a Piece That Evokes the Future Enter the Modern Domestic Realm? Saarinen’s desire to clear the interiors of American homes from the “slum of legs” inspired him to create this series. At the time, this was an idea so advanced that it was parallel only to visions of the future. For example, interiors in the 1960s space-age animated series The Jetsons were furnished with one-legged chairs. Obviously, the futuristic design of the Tulip suited high-tech settings, and it inspired the standard chairs on the sets of the starship U.S.S. Enterprise in the television series Star Trek. More recently, Tulip Chairs were spotted in an airplane scene in the movie Frost/Nixon. Despite these nontraditional and futuristic associations, the Tulip Chairs that were mass-produced several decades ago are today considered highly valued antiques. Furthermore, they can be incorporated into a wide variety of settings, including contemporary and traditional rooms. The Tulip is as popular today as it was when it was first introduced. Not many one-legged chairs have achieved the recognition of the Tulip, nor have they proven to be successful objects of design. Recently, Konstantin Grcic with his Chair One enthusiastically addressed some of these issues. Like the Tulip, Chair One evokes images of the future. Nevertheless, in contrast to Saarinen’s chair, Grcic’s chair honestly expresses the nature of its materials: a concrete base and an aluminum seat with a shape that emphasizes its ability to swivel. 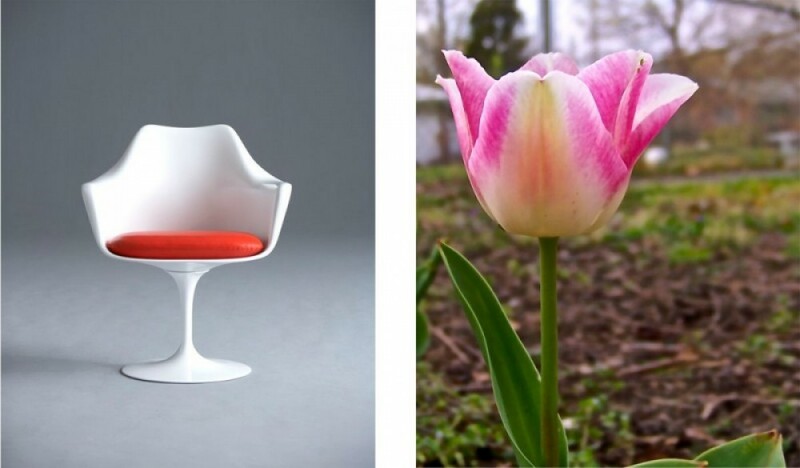 Despite all of these contradictions and unique associations, the Tulip Chair has successfully integrated itself into American interiors and is considered a classic in furniture design. What other pieces of furniture have posed these questions in the world of modern design, or does the Tulip Chair stand alone? Want to learn more about modern furniture design? The Berniece Bienenstock Furniture Library and the Salem College Chair Library are perfect places to start. We welcome students, and design professionals to investigate and to be inspired towards future design.